Along with age comes many, many unfortunate issues. But perhaps the most noticeable and most common of them all is having the skin on your neck and chest become loose, causing wrinkles and more. Products like Nectifirm (discussed in detail below) are designed to correct these issues. It happens to nearly everyone, but that doesn’t make it any less unappealing. Aside from the face, the neck shows age more than any other area of the skin. Modern medicine has solved this annoying issue with a surgical procedure known as a neck lift. The only downsides, however, are the cost and recovery times associated with it. A simple lift will set you back $4,000 or more. That’s a hefty price no matter how well off you are. There are other solutions available, though. If you’re able to be a bit patient and add another product to your daily makeup regimen you can easily reduce the signs of aging on your neck using special topical treatments such as Nectifirm from Revision Skincare. Down below, we provide a complete review of this neck firming cream that digs into the details of how it works, the ingredients that are found in it, what other women think of the cream, and more. Recommended for use by both dermatologists and surgeons, Revision Nectifirm is touted as one of the most effective and popular neck creams on the market. 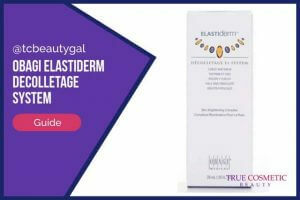 It uses a special blend of peptides, algae extracts, and other powerful ingredients that work together to provide intense moisture, gradually firm the skin, and eliminate dark spots and age spots around the decolletage. This cream is intended to be used daily on the neck and chest. It is applied topically and left on throughout each day. The manufacturer of the product, Revision, claims that with a couple months of regular applications you’ll notice that the skin around your neck will look smoother, be better hydrated, and, of course, much tighter. The formula that creates the magic of this product is actually quite simple. 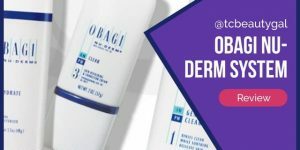 It’s a unique combination of peptides, various plant extracts, antioxidants, and more that, when combined, are able to effectively reduce the appearance of wrinkles, get rid of skin discolorations, and, most importantly, repair sagging skin. Nectifirm is approved for use on all skin types. It doesn’t contain any harsh chemicals that will irritate the tender skin on your neck or chest, nor will it cause any odd breakouts. As far as we can tell there haven’t been any reports of bad side effects or allergic reactions caused by the use of this product, either. When it comes to cosmetic products like this one, it’s never enough to read words on a page. What’s the age-old saying? “A picture is worth a thousand words.” That is definitely the case for products like Nectifirm. Below are some before and after images taken by patients of dermatologists and plastic surgeons that graciously allowed them to be released to show the effects of the product. In most of these cases the individuals used Revision Nectifirm daily for a total of 8 weeks. 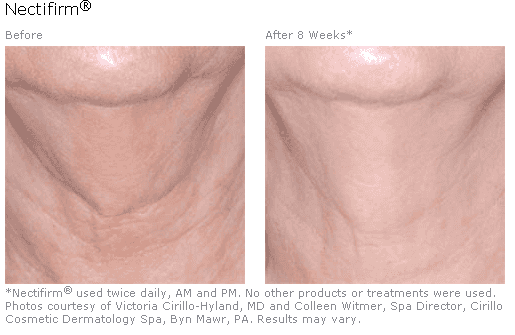 As you can probably see, there are noticeable differences in the smoothness, tightness, and wrinkles of the skin around the neck and decolletage on these women. Even some of the redness and dark spots these ladies had faded thanks to the cream. Before you put ANYTHING on your skin or in your body you should always make yourself aware of the contents of the product. 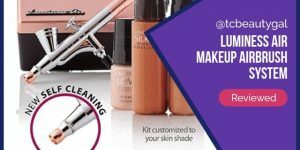 Some cosmetics make use of harsh chemicals and odd lab-created substances that can cause serious irritation or even damage to the skin. 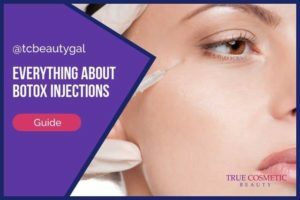 Plus, you need to give the ingredients list a look-over to ensure the product doesn’t have any substances that you know you are allergic to in it. Palmitoyl Tripeptide-5 is a substance that have been proven to work well for fading away wrinkles and fine lines on the skin. The baker’s yeast compound is used to help firm and tone the skin. The algae extracts are in the mix because they help restore the skin’s elasticity and make your skin hold moisture better. Ceramide 2 is an odd substance, but it works well for improving the overall water retention of the skin, as well as eliminating dry skin. The bamboo, silica, and English pea extracts all have natural properties that assist with getting rid of wrinkles and fine lines. The same goes for glucosamine. Dihydromyricetin is used to smooth out rough-looking skin. Finally, the vitamins help to remove discolorations on the skin as well as make it look and feel tighter. 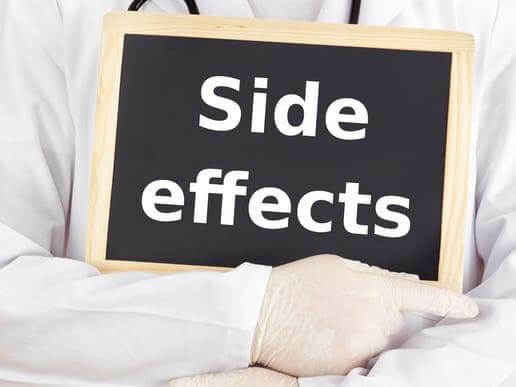 As we mentioned earlier, there are currently no indications that Nectifirm causes any undesired side effects. This information, however, has been gathered based on a sampling of individuals that have used the product for roughly 2-4 months. Prolonged use beyond that duration may have other unknown effects. A few users do claim, however, that they have been using the product for 2 to 3 years regularly without any issues whatsoever. To conclude – at this time I have absolutely no concerns you’ll experience any nasty side effects coming from the use of this neck firming cream. Not quite satisfied with the information we’ve provided about Revision’s Nectifirm cream? Well, you don’t have to rely solely on the details posted on this page. There are plenty of real customer reviews for the product that may help you get a better idea of how well it works and whether or not the product is the right cream to use on your neck. Over on Amazon.com, there are more than 400 reviews posted for this cream. From those 400+ reviews, it has received a decent rating. Several people have stated that they used Nectifirm for anywhere from 3 weeks to 2 months or longer and have seen significant, noticeable results. Some say that it works exceptionally well for firming the skin under the chin, on the neck, and on the chest. A couple users have even said that after having years of sun damage, melasma, and skin discolorations, that Nectifirm was able to effectively reduce the signs of aging by cutting down on wrinkles, removing age spots, and making the skin appear smoother all-around. Revision’s Nectifirm neck firming cream is a bit of an oddity when it comes to shopping around. It seems to be available from a select number of dermatologists and surgeons, but not in traditional cosmetic stores or even drugstores. The one place it is easy to find is online. Many different sites carry it, but you have to be careful where you purchase the cream from. 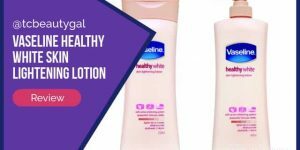 Some websites, like eBay, are often plagued with sellers that load empty bottles of name-brand cosmetics with cheap lotions and other ingredients that are NOT the actual product. Other sites, on the other hand, may offer the legitimate Nectifirm cream, but at a substantially higher price than is necessary. We personally recommend using Amazon. They often have competitive prices, ship items fast, and have great customer service. Don’t think Nectifirm is right for you? No worries, there are plenty of other options out there. 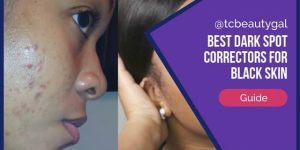 We recommend checking out our list of the best neck firming creams to see what other products are both safe and effective for use on your neck. This is a well-researched and developed list designed to help you find the best product for your individual needs. One of the most notable products we recommend aside from Nectifirm is StriVectin Neck Cream. It doesn’t work quite as quickly and it’s a bit more expensive, but it’s still worth a look if you’re not impressed with Nectifirm in any way. 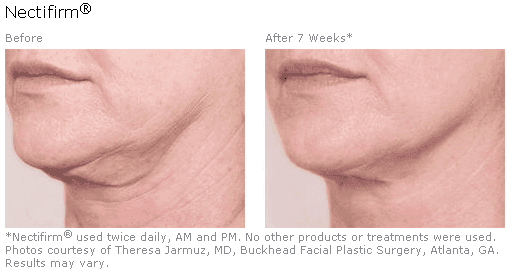 Keep in mind, ladies, that results vary from person to person no matter what neck cream we’re talking about. What works well for someone else may not give you the results you’re looking for. Overall, though, a good neck firming cream like Revision Nectifirm is a great place to start. Creams are far more affordable than skin tightening treatments or surgery. In most cases, using a simple cream on a regular basis will be more than enough to make significant improvements in your skin over time. Don’t think a cream is the right way to go for your needs? There are other ways to tighten, tone, and improve the appearance of the skin around your neck and chest, but most of them will cost you a good bit more. Skin tightening laser treatments are fairly effective and readily available at many dermatologists and medical spas in major cities. A single laser treatment typically costs around $200 to $500 depending on where you go. While one session can make a noticeable difference it’s not uncommon for women to need two or three sessions to fully realize their neck tightening goals. 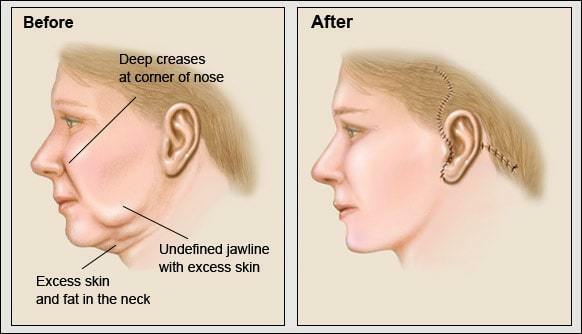 The other far more expensive treatment option is to have a surgical neck lift. This instantly fixes sagging neck skin, but it will set you back around $4,500 and require you to take off work for at least 2 weeks for recovery. This is why we recommend using a neck firming cream like Nectifirm first. 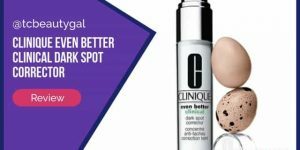 It’s far more affordable, doesn’t involve any down time, and is super easy to incorporate into your existing beauty regimen.